The Karoo Saloon & Rock Roadhouse, is set to become the best Live Music Venue in the Karoo. The Karoo Saloon Rock Roadhouse is something out of the ordinary with it’s live rock music events and hand painted wall murals by Marius, yet provides wholesome home cooked meals and clean ‘crashpad’ accommodation. Situated halfway between Cape Town and the Garden Route on the R62, the venue attracts motorcycle clubs, tourists – both local and foreign, day visitors who attend the music events and those who simply enjoy good food, cold beers, a refreshing swim in the pool and great views. This 53 hectare property stretches from the Karoo Saloon R62 Rock Roadhouse, across the R62, over a few mountains until it meets up with the Sambona Private Nature Reserve. Plans are afoot to create hiking trails and guests are currently welcome to walk and climb the mountains. Local flora and fauna changes with altitude, so be on the lookout for the wealth of variety the area has to offer. The village of Barrydale is situated 14 km to the east of the Karoo Saloon R62 Rock Roadhouse along the R62, with Montagu 44km away in the opposite direction. 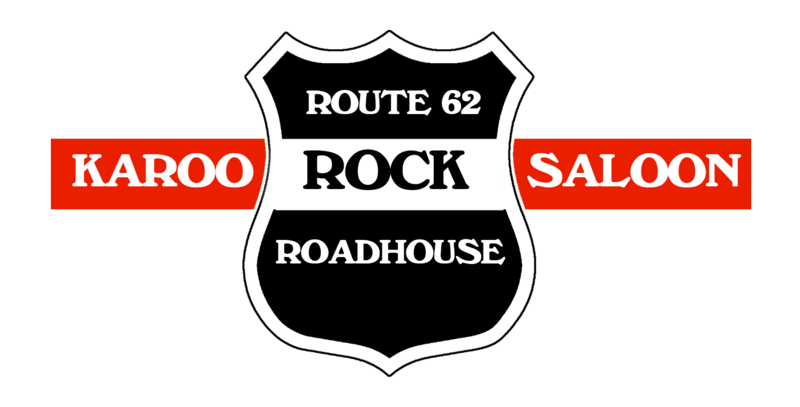 One Saturday night a month, the Karoo Saloon R62 Rock Roadhouse showcases a loud rock evening with a live band. Then, on the following Sunday, an acoustic session takes place around lunch time. On one other Sunday per month there is an additional Sunday lunch time acoustic session with live music. Marius who is passionate about music, ensures that rock music of all types is played the remainder of the time.